"I just finished reading your book, what a great book man, I love it! I think if world war III would have broken out I still would not have stopped reading the book until I was finished. I really had to force myself to stop reading because I had to go to the office, or bed or do something else beside reading. I live in Cabarete but have been to Santo Domingo several times, I love that place, I enjoy it every time I go there.....beside getting pulled over by lookalike "cops" demanding money for runnign red lights that were not even there.... just exactly like you describe in your book. Tome it seemed like you were writing about my life :- Thanks Man! Cheers Chris"
"Ross, I enjoyed reading your book. I thought it was well written and contained a lot of good information. It was well worth the cost. I have made several trips to the Dominican Republic and have met a lot of people. I have seen or heard of many situations similar to some of the ones you describe in your book. However, your story is certainly different than most in that you were able to maintain your US income and live in the Dominican Republic. My current plans include moving to the Dominican Republic at least part time in the near future. From your book, I got some good ideas about how to earn some income while living in the Dominican Republic. Thanks. 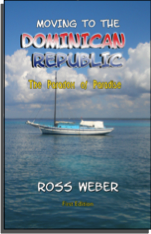 Moving to the Dominican Republic The Paradox of Paradise is a great book full of stories about Ross Weber's experiences in the Dominican Republic. Ross writes about the lessons he learned as he grew to love the Dominican people, adapt to the Dominican culture, and understand the island's advancing infrastructure. This website has information on the Dominican Republic, pictures of life in Santo Domingo, a book buyers' bonus section, and tips for tourists who will be visiting the Dominican Republic or Santo Domingo. This book is about how I decided to move to the Dominican Republic and maintained a first world income. Looking back it was not all that difficult. I did learn a lot of lessons and the process was fun! Join Me on my Adventure by ordering your Copy today! Print and Ebook versions available. Join the adventure for only $20. Buy a copy and join me on my Dominican Republic Adventure! Ross's book Moving to the Dominican Republic: The Paradox of Paradise is about the hilarious yet serious lessons learned as an American who has decided to move to the Dominican Republic. It is a must read for anyone who has wondered what it would be like to live in the Caribbean. 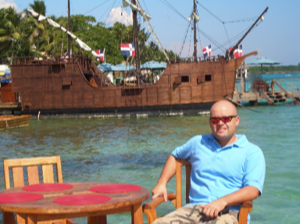 Ross uses real life experiences to describe the culture shock and other setbacks of making the transition from living in the United States to living in the Dominican Republic. The book includes both personal stories as well as unique observations to describe the ups and downs of living on an Island. If you have lived in the Dominican Republic you will love this book. If you are planning on visiting the Dominican Republic, the lessons in this book will help you be prepared. If you are interested in international living, or possibly retiring in the Caribbean, this is the perfect book for you! It is full of Dominican Republic Information you will love. The aim of this website is to be the leading site on the internet with personal views on life in the Dominican Republic. The majority of the information contained on this site is from experiences of the author, Ross Weber, as he moved to Santo Domingo, Dominican Republic. Ross loves life in the Dominican Republic and spends his free time time writing about the Dominican Republic and taking pictures of amazing Dominican things. Also included in the site are free tips and tricks for traveling to the Dominican Republic. The site is maintained to increase book sales. It is not intended to replace the book, and does not include the same stories or content found in the book, so buy a copy of the book today. As a frequent flyer and frequent international traveler, some of the most important stories and lessons Ross writes about have to do with security, both personal and financial. For personal security while traveling check out this article about tourist safety in the Dominican Republic. So Many Great Pictures So Little Space!!! If you are a frequent visitor to this site you already know about the great pictures we have located on our Great Dominican Republic Pics Page. Now, these pictures are not the ordinary babes and beaches pictures you would expect on a site about the Dominican Republic they are REAL LIFE Dominican Republic pictures. They are things you would never even dream of seeing in Toronto, Paris, London, or New York. Ever seen a guy ride a bike while carrying a goat? You will here. Ever seen a family of five riding a moto? You will here! How about riding a motor cycle in the rain and using an umbrella so you do not get wet? Got it! Have you ever seen a moto tow-truck? Got it! How about carrying a cow on a moto. You wont believe it! There are a ton of incredible never before seen pictures. I also add new ones to the Book Buyer's Bonus section all the time. I actually go picture hunting every day when I drive around the country side of the Dominican Republic. Place an Ad on MovingtoDR.com. Do you have a business related to the Dominican Republic? Want to advertise on this site? We will soon have advertising space available. Make sure you contact us quickly so you are first on the list in your category. You can also apply to have your business reviewed on a page of its own. I am going to allow Dominican Republic based businesses to apply to have their business, hotels, resorts, vacation homes or restaurants reviewed. To properly review your business I will need to spend some time getting to know the location, its amenities, and the surroundings. I will write a review of the things I like about your business, the atmosphere, its location, the staff, and whatever else gets me interested. To have your business reviewed contact me at ross@MovingtoDR.com. Here is an example of a review I wrote for a Santo Domingo Restaurant. Travel tips for the Dominican Republic. Over the past four years I have had the opportunity to enter the Dominican Republic hundreds of times. I have flown from just about every US airport with a connection that lands in Santo Domingo, Dominican Republic. One of the things I have noticed is that Dominicans have their own set of rules when it comes to traveling. They have a different outlook on life, which is much more laid back and care free than most Americans are used to, and this transfers to their travels. It is something I really love about the Dominican Republic. There is never a feeling that the world is coming to an end tomorrow. The Dominican people have been through a lot and know that whatever crisis they are in the middle of at the moment will pass. I really need to learn from their example. On a flight I recently took I was making a connection in JFK on my way to Santo Domingo. As is fairly normal, I went into the mens room prior to the flight. If you have never been in a men's restroom there are urinals lined up against one wall and stalls with doors lining the other wall. If you need to go number one you just use a urinal. If you need privacy or have to go number two then you use a stall. It is a fairly simple thing to figure out. Well during this visit to the mens room, I only needed to go number one so I was happily standing at a urinal against the wall. To my surprise, when I was just about in the middle of relieving myself, I heard a woman's voice behind me. The voice was speaking in spanish and was saying "hey Milda where are you?" I may add that the lady was speaking rather loudly. After a few tries Milda's friend was happy to find out that Milda was situated in the stall directly behind me. Milda responded, "I am here" and then kept talking about the flight and whether it would leave on time. By this time I had gotten to the point of my business that I decided I needed to leave the restroom. I figured either I had gone into the wrong restroom (couldn't figure out why there were urinals) or these two ladies were in the wrong restroom. Either way, I wanted to get out of there. As I made it to the sinks to wash my hands, Milda came out of the stall with her bags and joined me. I guess we both figured it was a little awkward to say anything so we both just stood there washing our hands. I finished first, so I dried and left. The entrance to the restroom was situated just next to the gate for our flight to the Dominican Republic, so I decided to kind of stand and observe for a few minutes. As Milda and her friend left the restroom, I noticed a man outside who immediately went to them and pointed out that they were exiting from the mens room.